Select the Holds tab to display a list of items you have holds (reserves) on. You can sort the list by Title, Author, and Format by clicking on the blue text. The first click sorts the list ascending, a second click sorts the list descending, and a third click returns the list to its original order. You can use the checkbox beside each hold to select the hold and the Action for selected holds dropdown list to suspend, activate, or cancel the selected holds. You may set an activation date when you suspend your hold or leave the date blank and manually activate it later. A suspended hold will not lose its hold queue position. The Status column shows whether or not your hold is currently available for pickup, if it has been suspended, and what your position is in the hold queue. Your position in the hold queue is indicated by the first number in the status column. For example "Hold #3 on 1 copy" indicates you are third in the hold queue. Clicking the Edit link will bring you to the hold editing screen, where you may suspend the hold, if not already captured, or change the activation date or cancellation date. 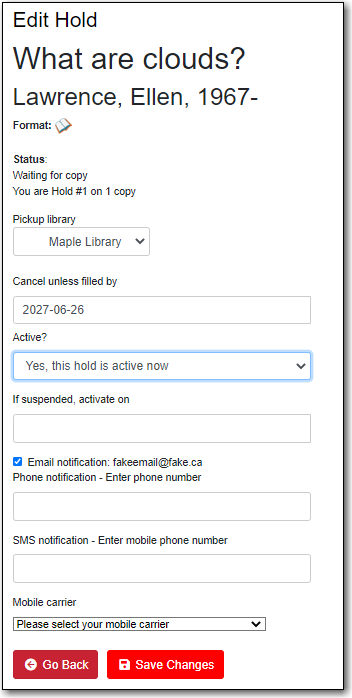 If your library has multiple branches you may also change the pick up location. 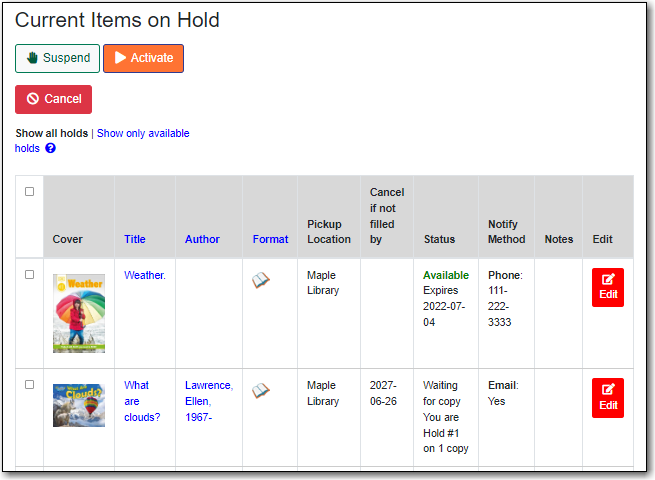 Select the Holds History tab to display a list of items that you have previously had on hold.